Traudl Junge (born Gertraud Humps) was Adolf Hitler's youngest personal private secretary, from December 1942 to April 1945.Gertraud "Traudl" Humps was born in Munich, the daughter of a master brewer and lieutenant in the Reserve Army, Max Humps and his wife Hildegard (nÃ©e Zottmann). She had a sister, Inge, born in 1923. As a teenager she thought of becoming a ballerina. Traudl Junge began working for Hitler in December 1942. She was the youngest of his private secretaries. "I was 22 and I didn't know anything about politics, it didn't interest me", Junge said decades later, also saying that she felt great guilt for "...liking the greatest criminal ever to have lived." She said, "I admit, I was fascinated by Adolf Hitler. He was a pleasant boss and a fatherly friend. I deliberately ignored all the warning voices inside me and enjoyed the time by his side almost until the bitter end. It wasn't what he said, but the way he said things and how he did things." At Hitler's encouragement, in June 1943 Junge married Waffen-SS officer Hans Hermann Junge (1914â€“1944), who died in combat in France in August 1944. She worked at Hitler's side in Berlin, the Berghof in Berchtesgaden, at Wolfsschanze in East Prussia, and lastly back in Berlin in the FÃ¼hrerbunker. In 1945 Junge was with Hitler in Berlin. She typed Hitler's last private and political will and testament in the FÃ¼hrerbunker a day and a half before his suicide. Junge later wrote that while she was playing with the Goebbels children on 30 April, "Suddenly [...] there is the sound of a shot, so loud, so close, that we all fall silent. It echoes on through all the rooms. 'That was a direct hit,' cried Helmut [Goebbels] with no idea how right he is. The FÃ¼hrer is dead now." On 1 May Junge left the FÃ¼hrerbunker with a group led by Waffen-SS BrigadefÃ¼hrer Wilhelm Mohnke. Also in the group were Hitler's personal pilot Hans Baur, chief of Hitler's Reichssicherheitsdienst (RSD) bodyguard Hans Rattenhuber, secretary Gerda Christian, secretary Else KrÃ¼ger, Hitler's dietician Constanze Manziarly and Dr. Ernst-GÃ¼nther Schenck. Junge, Christian and KrÃ¼ger made it out of Berlin to the River Elbe. The remainder of the group were found by Soviet troops on 2 May while hiding in a cellar off the SchÃ¶nhauser Allee. The Soviet Army handed those who had been in the FÃ¼hrerbunker over to SMERSH for interrogation, to reveal what had occurred in the bunker during the closing weeks of the war. In 1942 Germany, Traudl Junge was a young woman with dreams of becoming a ballerina when she was offered the chance of a lifetime. At the age of twenty-two she became private secretary to Adolf Hitler and served him for two and a half years, right up to the bitter end. 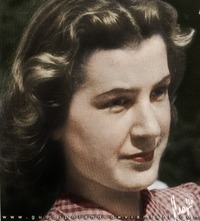 Junge observed the intimate workings of Hitlerâ€™s administration, she typed correspondence and speeches, including Hitlerâ€™s public and private last will and testament; she ate her meals and spent evenings with him; and she was close enough to hear the bomb that was intended to assassinate Hitler in the Wolfâ€™s Lair, close enough to smell the bitter almond odor of Eva Braunâ€™s cyanide pill. 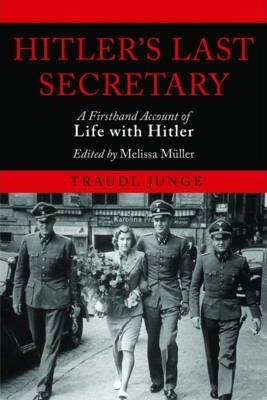 In her intimate, detailed memoir, Junge invites readers to experience day-to-day life with the most horrible dictator of the twentieth century.